…the learning styles that most people think of when we use the phrase are bunkum. Despite this seeming to be common knowledge I still surprise groups of teachers when I mention it in passing whilst I’m delivering inset. Some teachers still seem to be wedded to the idea, they berate me for telling them, generally refuse to accept what I say and continue, I expect on their merry way, being style gurus… Give us a ‘V’; Give us an ‘A’; Give us a ‘K’! But this doesn’t mean there aren’t different styles of learning. The way someone learns football is very different to the way one learns latin, learning to dance is very different than learning to math! These specific styles are part of the tradition of imparting knowledge in a particular subject. As a drama teacher I become quite concerned when drama is used as a pedagogy to teach subjects which might be better communicated in ways that have worked successfully in teaching that subject for years. Mind you role play can be to drama what display work is to high art, a different thing altogether, sometimes done well but sometimes done atrociously. When I was at school, in the third year, I was moved from the bottom set to top set French. I didn’t have much of a clue to what was going on, but I would listen and doodle in my exercise book. I doodled copiously as I listened and tried to absorb all this highfalutin new knowledge that was cascading over me, someone who had little grounding beyond, well, doodling in my bottom set class. Anyhow, at some point the teacher stopped in mid flow, saw that I was doodling in my exercise book, albeit in the ‘back’ of the book (a sacred area that any pupil worth their salt knows is more ‘theirs’ than the teacher’s who should spend their time looking at what is in the front part of the book, but that is by the by…) The French teacher marched over to my desk, held my book aloft and showed the rest of the class my doodles, page upon page… He was flabbergasted! Aghast! Shocked! Never in his life had he seen! Didn’t I want to learn?! A ruler slammed across my hand, punishment for my ‘bottom set behaviour’! Well, now, it seems as if doodling might be a good way of ensuring one learns new information, well maybe not my doodling in French class, but “drawing during learning appears to be a potentially powerful strategy for improving students’ learning…” in a science class according to this study. Perhaps I will have the last laugh! Ha! The reason I don’t know French is because I wasn’t allowed to doodle! Bon, that’ll show him… Well, maybe, but there is not enough evidence for me to approach smug level ten. This ‘style’ of learning is something a lot of us do naturally, in meetings, in classes, give us a pen, an agenda and a good deal of info, many of us resort to doodling as we absorb, I wonder if it helps? The style in which we learn does make a difference dependent on our level of expertise: “Instructional techniques that are highly effective with inexperienced learners can lose their effectiveness and even have negative consequences when used with more experienced learners…” (see here) And that, “…there is evidence that novices learn better from studying examples, whereas those with more expertise learn better by solving problems themselves,”(see here). There are other examples of this, in fact, I posited the same idea in Trivium 21c, basically people learn differently depending on their level of expertise in a given field and the amount that they know about what they are learning. For a teacher this means they need to be aware that how they teach does need to change as they go through a course and/or a topic dependent on the relative and, hopefully, growing expertise of their students; I expect for many teachers that this is common sense. 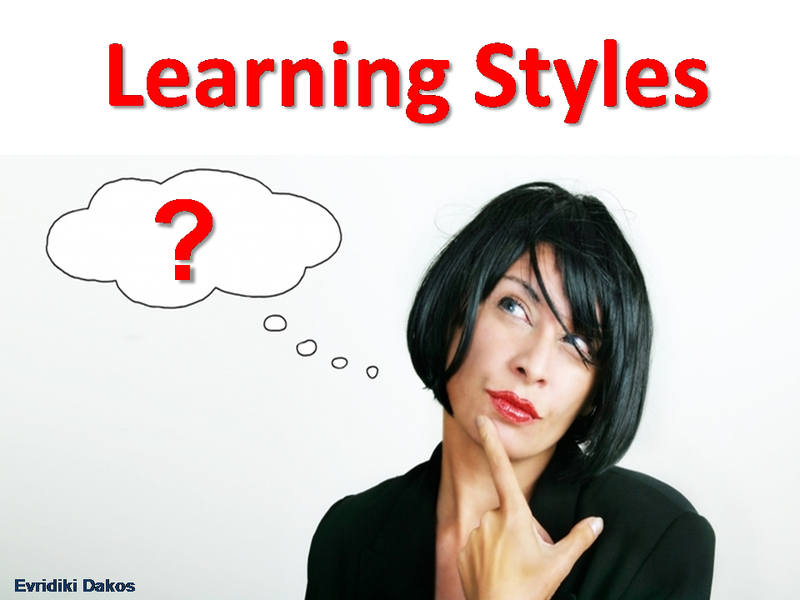 Perhaps when we talk about learning style and adjusting teaching style in the future we can automatically think of this rather than as some still think, wrongly, about learning styles today. Or do you think this will turn out to be bunkum too? On the Octagon Table: Does Mixed Ability Teaching and Learning Work? Prick Us, Do We Not Bleed? Teach Us, Should We Not Study? Better to avoid a bankrupt term rather than imbue it with new meaning. You’re right to point out we learn differently in different subjects and at different stages of expertise but these ‘differences’ are similar: we all learn different subjects in ways that are broadly the same. We all learn as a experts and as novices in ways similar to all other experts and novices. Do we learn dance in broadly the same way as maths? Ah, if only we learned dance in maths. The problem with VAK is not that it is total bunkum – it has some basis in research and also in my personal experience. The real issue, and what makes it frequently bunkum, is how it is misused, misinterpreted and mystified as some absolute distinction and sacred truth. It then becomes, if you will excuse the use of the pun, VAKuous. No-one is wholly V or A or K; the whole point is that it is a sort of dynamic and people forget this. Also, there are more styles of learning than just the sacred 3; I work much better with others than on my own because I learn better in collaboration and social situations. I am not very good at science because my observational skills are weak and I find it difficult to focus on the details whereas I like the ‘big picture’ and so am quite into the philosophy of science. However, we need to bear in mind that learning styles and teaching approaches are not synonymous. The teacher adapts her/his approaches according to a lot of factors, including learning styles. Displays are not art, role plays are not drama, tapping the desk is not music!! but they are ways of engaging learners at different levels and with different preferences. Learning is rich and complex and we should beware simplistic short-cuts! I wonder if its true that your ‘observational skills are weak’? Or is it that you have yet to be taught well about how to observe and therefore haven’t been able to practise? A bit like mindset perhaps? Or perhaps you are right, we are so genetically coded that we can’t break out of certain skills and behaviours and therefore shouldn’t be taught in a way that expects us too? Is VAK similar to IQ in this respect? Don’t we just like labels in education! Find something, label it then make it a subject to study before finally assessing it in order to apply another label. The real benefit of learning styles is that it starts a discussion about how we learn best, when, and how and with what support or resources and in what conditions. Knowing these things can help us take control of our learning environment, so long as we develop the appropriate skills, attitude, attributes and behaviours. You are right in pointing out we tend not to challenge the myth and therefore perpetuate it. I also think people go looking for simple answers to complicated questions. The mission, should you accept it, is to always challenge the myth. Perhaps by doing so we can overcome a few and expose the nuggets of truth that actually impact teaching and learning. For my part I believe there are a set of skills, attitudes, attributes and behaviours that successful learners,(and by that I mean those that can manage their learning environment to meet their learning needs), exhibit. You can find a list of them at: https://magic.piktochart.com/output/2297869-learning-intelligence. Happy to receive any challenges. VAK too simplistic teachers need to look tag the work of Anton Gregorc and Kathleen Butler. Is there anything you’d recommend to read in particular?